Compiled by: Eric ten Raa. Edited by: Christopher Ehret, Patricia Ehret. In collaboration with: Edward D. Elderkin. 8 pp. Roman, 217 pp. Sandawe is the first language of around 40,000 people who live in the Dodoma province of Tanzania. This language is notable for being one of three in East Africa with click consonants as part of their regular consonant inventory. Sandawe’s affiliation is not satisfyingly defined, but due to the present clicks, scholars mostly situate it in the Khoisan language family, and a more recent study by Güldemann assumes that it is actually part of the Khoe subgroup. At the phonemic level, Sandawe has a system of 39 consonants, including 15 click consonants. Five vowels – a, e, i, o, u – occur both short and long, and an underlying tone system, high and low, can be found. The present dictionary was compiled from the extensive field collections of Sandawe lexicon undertaken by the late Dutch anthropologist Eric ten Raa (1924–2005) who was living and working among the Sandawe people in the 1960s and 1970s. The primary data was recorded on more than 10,000 note cards, including – besides thousands of Sandawe words – extensive notes on the cultural contexts and usages of those words. A feature of great value to comparativists and scholars interested in using linguistic evidence for history is the identification of loanwords and of probable and possible loanwords from several Southern Cushitic and Bantu languages. 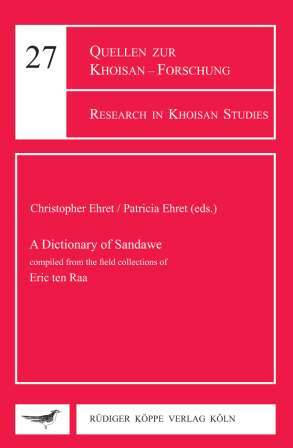 The dictionary serves not just as a general lexicon of the Sandawe language but as an introductory ethnographic dictionary of Sandawe culture. For this reason, extended definitions of many of the terms are presented, along with their contexts in culture, as described by ten Raa. The dictionary contains his list of Sandawe clan and subclan names, personal names, and ethnic names as well.